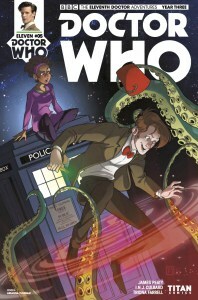 So I made my return to the Eleventh Doctor and I want to say I was pleasantly surprised. In this issue we find the Doctor traveling to the Devil’s Eye. It’s a vacation pleasure cruise space ship thing that happens to terrorized by the OOD at the time of our story. Most people recognize the OOD as an evil entity in the Doctor’s world. The story has a bit of twist in more of an environmental sense. The issue is well written and definitely reads well a second time. I just wish the artwork was more detailed because it would help add to story’s engagement. Otherwise the characters have a solid likeness and facial expression. While the art could have packed a little more punch, the story is delivering a solid adventure that I’m excited to see where it goes.